Shrine of Remembrance medal 1934 . Who was Nellie Payne? 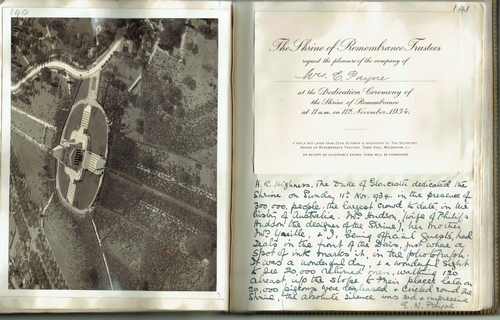 Shrine of Remembrance in Nellie’s scrapbook. In 1934 there came a proud day – to be followed by a still prouder one. By post there came an invitation from the Shrine Trustees to attend the ceremony of dedication of the Shrine of Remembrance in Melbourne on November 11 (Armistice Day) by H.R.H. the Duke of Gloucester. When the entree cards arrived she found that she was to be the special guest of Philip Hudson, the architect of the Shrine. The occasion was spectacular, and one which those who were present will never forget; for, besides being spectacular, it was moving to the point of tears. The Great War had been over for sixteen years, and every year since then great throngs of former sailors, soldiers and airmen had marched once a year to attend a simple service in remembrance of former com­rades who had not returned. 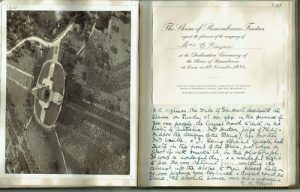 The dedication of the Shrine, which was newly completed, was de­signed to mark the culmination of all those great assemblies of service­men, and arrangements had been made for a vast gathering of the public on the broad lawns surrounding the Shrine between the Botanic Gardens and St. Kilda Road. Special enclosures had been reserved for the relatives of soldiers, sailors and airmen who had given their lives, and for official guests. In one of those enclosures, facing the official dais, Mrs. Payne found herself seated, along with Mrs. Hudson and other official guests. Around them pressed a crowd variously estimated at between 300,000 and 500,000 people – the greatest crowd that had ever assembled in Victoria up to that time. And presently there came marching down St. Kilda Road the troops, more than 20,000 of them, representing every naval, military and air force unit that had served Australia during the war, and many from beyond the seas. Rank after rank they marched down the road, bearing unit flags and banners as they came, and many of the crowded onlookers doffed their hats as the regimental colours with their battle honours went by. Into the broad southern avenue leading to the Shrine the great column swung, marched steadily up the slope until, at the top, the ranks halted and closed up, facing the dais ready for the ceremony of dedication. While the troops and the crowds waited in silence for the proceedings to begin, Mrs. Payne, greatly moved by the spectacle of the march, climbed upon her chair the better to see the ranks of the servicemen over the heads of the crowd. Presently, as she stood there watching, some of the soldiers in the nearer ranks caught sight of her, and a cheer broke out; for she was wearing the official ‘mothers badge’ issued during the war to those women who had a husband or sons on active service. Mrs. Payne’s badge had two bars, showing that three of her family had served their country, and so the troops gave a spontaneous cheer for the gallant old lady and the sacrifices she had made. She climbed down from her elevated perch and resumed her seat with proud tears in her eyes; and in after years nothing could ever erase that moment from her memory.